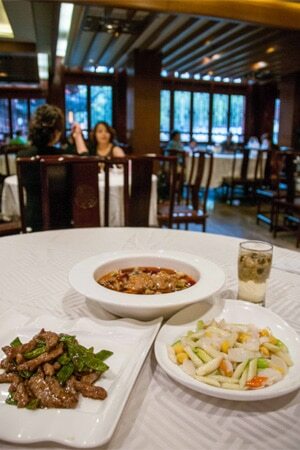 Famous restaurant with good Shanghai-style food in a traditional-looking building. : Located in the touristy Yuyuan Gardens area, Lu Bo Lang hosts plenty of tour groups and passing trade. Expect to be handed a numbered ticket and have to wait for a table unless you reserve a private room upstairs. The menu is fully in English accompanied by pictures, and all prices end with “8,” a lucky number in China. Tables are large with the smallest seating eight; try to get one near the window overlooking the lake and pavilion. Food is good but there are many Chinese restaurants of equal caliber or better. If you are too late for lunch, go for the afternoon dim sum, especially the lightly fried shrimps or eight treasure duck.